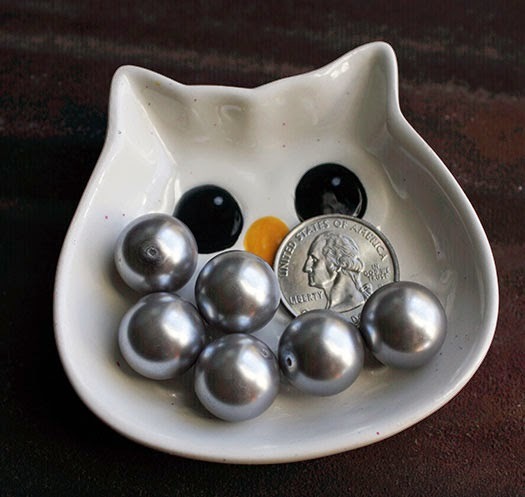 For the last issue of ZnetShows' Creative Spark magazine, Cynthia Machata (Of Antiquity Travelers) picked out some beautiful gray pearls from ZnetShows' huge Glass Pearl selection. (Huge is a key word here. . .) Cynthia openly admits that she has trouble with measurements so when the 16mm pearls arrived and were so large, she was surprised. Whoops! After creating her design for the magazine, Cynthia realized that she was challenged by the size and would likely not use up both strands of the beads on her own. Instead of just shelving the beads, she e-mailed several bead bloggy friends and asked if they would be interested in working with her "Whoops" beads. I was included in that list. I'll admit that the size of the beads and my limited time had me hesitant to join the challenge. However since I do love a good challenge, I decided to play along. The beads are definitely larger than what I'm used to working with too, but that didn't stop me from coming up with design ideas. Actually, I had my own "Whoops" as I initially envisioned using one of these big, beautiful beads as the focal for a statement ring. It definitely would have been gorgeous too, if I had ANY skill at making rings with wire. Alas, it didn't turn out at all as I had envisioned and was soon cut apart for my next idea. 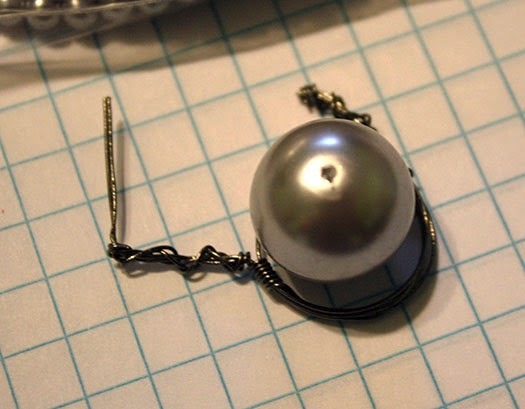 In working toward my next design idea, I was happy to discover that I had a stockpile of 4mm pearls in the same gray color and some 6mm glass pearls in dark gray, both from ZnetShows.com. I planned to pair the pearls with silvertone chain. However, while picking out the silvertone chain, I was drawn to a length of gunmetal chain and couldn't resist taking it home too. Once home, it was obvious that the gunmetal chain was the way to go. Vintaj 24g Arte Metal wire was then used to connect the pearls to each other and the chain. Here are my results. I used all the pearls from Cynthia in this necklace. I know it's also a little simple for my usual style. While I wanted to incorporate something a little more. . . upcycled (like the pieces Christine sent me), these pearls really make their own statement so I left them alone. I'm glad that I jumped on board with this challenge because the end product turned out so beautifully. I'm anxious to see what the other participants did with their large pearls. You can check it out too by following these links. Thank you Cynthia for including me. It was that perfect balance of a challenge and inspiration. I hope all of you like what I made, but would love to hear what you think either way. Your necklace is gorgeous in it's simplistic design, you did a great job of showcasing the large 16 mm pearls. The necklace is a classy piece, that can be worn dressed up or down. oooooh!! I LOVE this! I laughed at your comment these beads wanting to make their own statement - oh, but don't they! they kinda demand to be the star of the show! And you really did make a gorgeous necklace. So beautiful in its simplicity, but elegant in its length and swing (it no doubt has when worn). Thank you Hope for joining and having a bit of fun with us! The necklace is simple but elegant, and versatile enough that it'll probably be something you wear all the time. The gunmetal chain was the perfect choice - it makes the necklace look like an heirloom you've treasured for years. You've proven that the lady-est of ladies can rock some big balls! Nice! This is classic and very wearable. Really nice, Hope. Hope you're healing well! 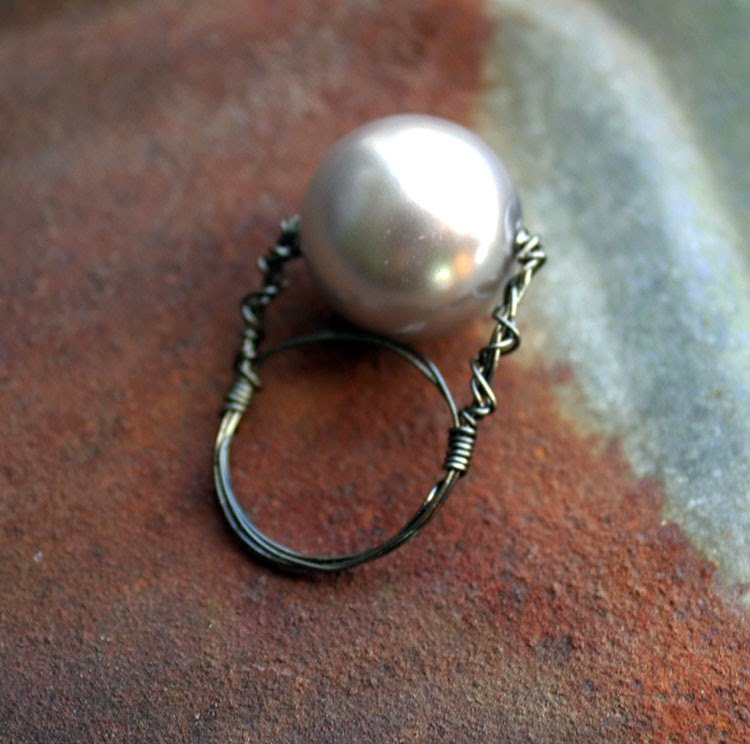 The pearls look fabulous with the gunmetal! I love the overall design. It is a simple strand that will work with just about any outfit. The industrial look of it is really cool too. Simplicity at its absolute finest! Hope, this is wearable, beautiful, edgy, elegant...all the things a piece if jewelry needs to be all rolled into one. 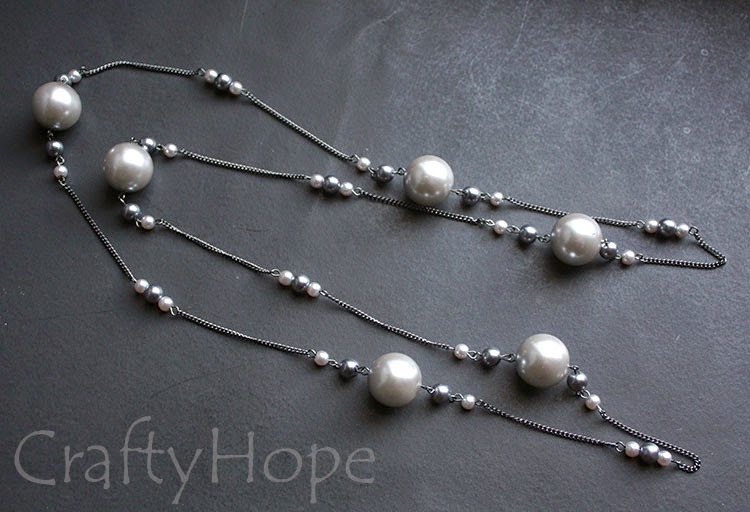 Gunmetal was definitely the better choice ~ it makes those pearls pop! They were going to be the stars no matter what, but the gunmetal gave them the extra opportunity to stand out. Love this piece! Your ring is a good start. Maybe you will try again sometime? Beautiful! Very balanced and at the same time the huge pearls draw the attention. And I like the chain and wired links look very much. Simple, but a great look! Gunmetal was the perfect metal choice. Good job dealing with a difficult challenge! You made a great necklace. I love the gunmetal chain with it. 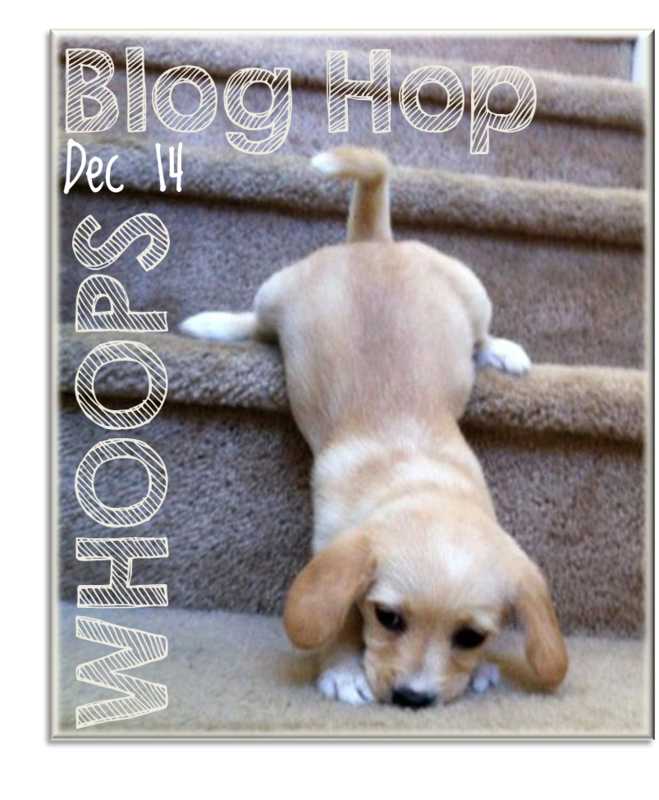 Glad you shared your own "whoops" moment! Love your new necklace! 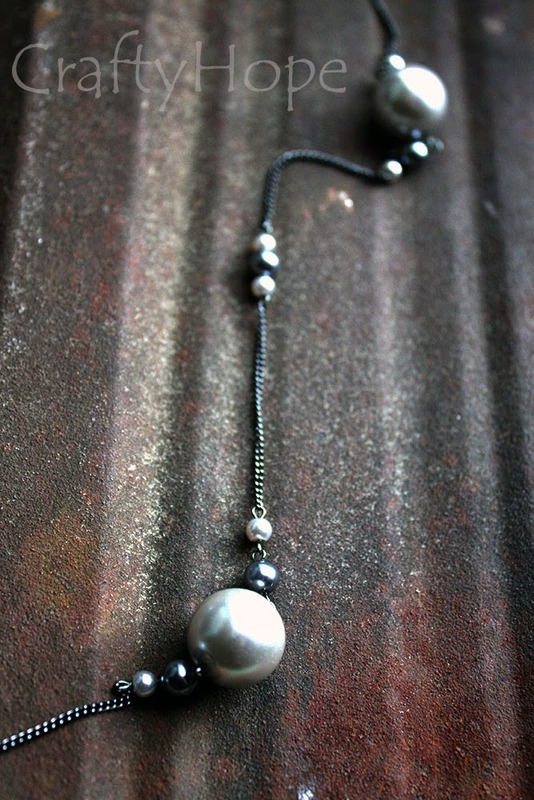 Gunmetal and pearls, how beautiful! I love the simplicity. Its so feminine. 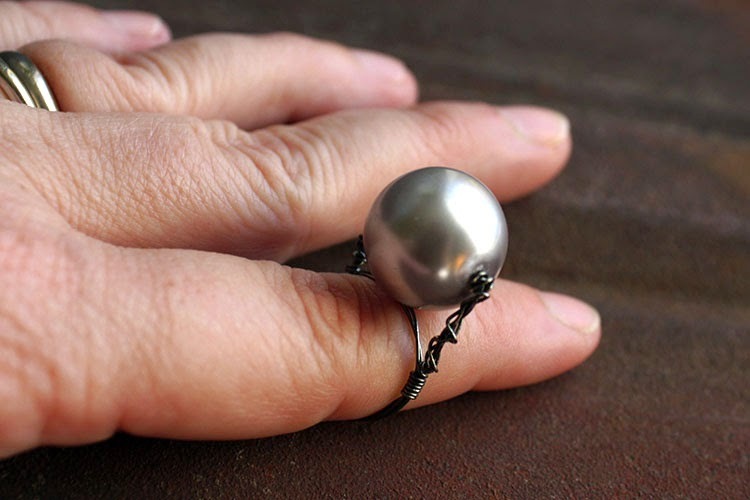 Lee, Yup. . .gunmetal and pearls. I like how they play off each other. I'm so pleased you like it too! Thank you! Thanks for stopping in to see me, Hope! I think you did great with these beads! Kelly, You are very welcome. And thank YOU for your sweet words. I appreciate it greatly! Wow, I think your necklace is fabulous!! Hope you're on the mend! Jenna, Thank you! I am feeling much better but thankful that I have lovely people like yourself thinking of me (and more clothes than I thought with elastic waste-bands! Ha! ;) ) Thanks so much. Beautiful necklace. I love the gray pearls. I used similar gray pearls in a challenge with gold tone jasper. The gray just seems so regal looking. Great job! Veralynne, Ohhhh. . .regal. I like that! Gray with a gold tone. I bet that popped! I got stuck in a rut I think with the neutral colors and just couldn't imagine anything else with the gray but more gray. That's not my usual style at all, but I think it worked. Thank you for hopping by! Hope, I love the necklace. It is a show stopper! The gunmetal wire is perfect and the 4 mm beads were a perfect match. I love it! If you have any beads left, how about a bracelet? And, keep working on that ring! It's a great idea. Kim, A compliment like this from you means so much, my fashionable friend! A bracelet huh? I don't have any more of the larger pearls, but lots of the 4mm and 6mm ones. I might have to think on that one. Thanks for the kind words, suggestion, and encouragement. They mean so much! Love anything with pearls, and I think it looks marvelous! That necklace is great! I tend to make the fussier designs but I am all about simple for myself. Wow - your necklace turned out beautifully! Love the gunmetal with that color of pearl! Thanks so much for visiting my Workspace Wednesday posts! Your jewelry is just gorgeous! LOVE the ring! Hi Hope, I am glad you are recovering well. The gunmetal chain looks wonderful with the gray pearls. This is a case os simple looks best. Becky, Thank you! Yeah, the size of those pearls really wouldn't let me elaborate much on the design. They had to be the star of this show. Thanks for hopping by! I love the necklace...Great job. Love reading your blogs. so fun to see everyone's crafts and designs.